Q*bert was the collaboration of artist Jeff Lee, programmer Warren Davis, and sound engineer David Thiel. 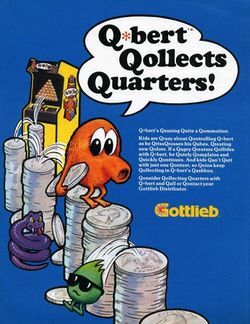 Like many early game concepts, Q*bert started out much differently than the eventual form in which it was released, but the result was a very innovative and fun game that did very well in the arcades. It contained a variety of features, ranging from the pseudo-3D look of the pyramid, to the physical knock sound generated from pinball hardware whenever the player fell off of the pyramid, and the famous unintelligible Q*bert swearing that he uttered when he collided with an enemy. In 1982, Parker Brothers was determined to become a major player in the video game industry. As such, they joined the race with Atari, and later Coleco, to acquire the home conversion rights to several popular arcade hits. Along with Frogger and Popeye, they scored the rights to release Q*bert for home systems and computers. In 1989, Konami released the game for the NES under the Ultra Games label. Since then, the Q*bert license has been brought back like many classic gaming icons. Updated versions have appeared on the Game Boy, SNES, PlayStation, Sega Dreamcast and Windows. The last three editions were a 3D version produced by Hasbro Interactive. Like many of the earliest video games, there is no distinct reason provided as to why Q*bert must jump all over multiple pyramids and change the color of every block top. It is simply your job to guide him safely through each stage, avoid all the enemies who would like to stop him in his quest. You control Q*bert, guiding him in four diagonal directions with the joystick. You must jump on every cube top and change it to the target color indicated at the top left corner of the screen in order to advance to the next stage. You must avoid contact with every red ball and any purple object. When a purple ball reaches the bottom of the pyramid, Coily hatches from it and chases you. If you lure Coily to an edge and jump on a disc, Coily will jump off the pyramid, resetting the enemies on the stage. You can touch anything green. Touching a green ball will briefly freeze everyone but you. This page was last edited on 10 February 2016, at 15:40.